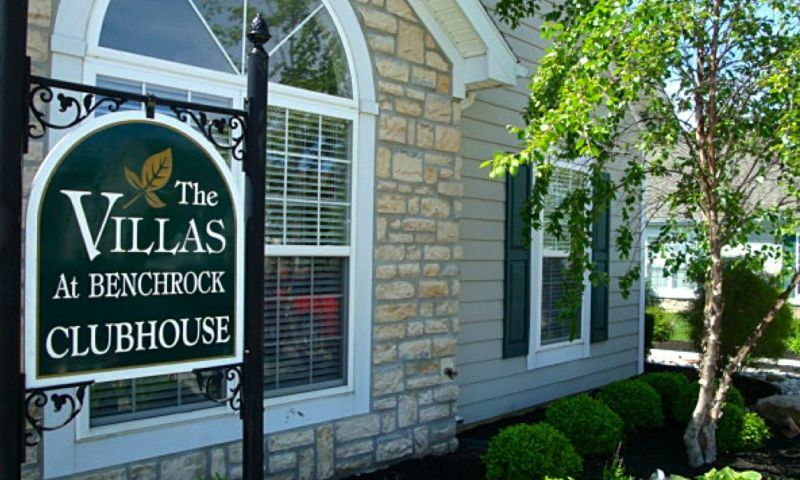 The Villas at Benchrock in Tipp City, Ohio is an active lifestyle community located near the Cincinnati area. The Villas at Benchrock provides homebuyers with a variety of elegant home designs that can suit their needs. Homeowners can also enjoy a charming neighborhood setting as well as great amenities that enhance a carefree lifestyle. The social hub of The Villas at Benchrock is the clubhouse. Residents have access to great amenities that will keep them busy throughout the year. Homeowners can get fit in the exercise room, prepare a quick snack in the catering kitchen, hang out with neighbors in the multi-purpose room, or play pool at the billiards table. Residents also have great outdoor amenities to help them maintain an active and social lifestyle. They can swim a few laps in the outdoor heated pool or read a book while lounging on the spacious patio. Homeowners can get some fresh air and enjoy a lovely stroll along the walking and biking paths while viewing the community's scenic ponds. Epcon Communities began construction in The Villas at Benchrock in 2005 and built 112 attached homes. Homebuyers have four floor plans to choose from, the Aboreta, Colonnade, Ducal, and Canterbury. These attached homes offer 1,137 to 1,861 square feet of living space. They have two bedrooms, two bathrooms, and two or two-and-a-half-car garages. These elegant attached homes feature flexible living spaces, a private courtyard or veranda, plenty of natural lighting, gourmet kitchens, spacious master suites, and large walk-in closets. Residents in The Villas at Benchrock can live a maintenance-free lifestyle. The homeowners association (HOA) takes care of the hassles of exterior home maintenance as well as snow removal and lawn maintenance. Residents have more time to enjoy their free time doing fun activities or socializing with other neighbors. There will be plenty of community events and activities held throughout the year as the neighborhood continues to grow and welcome new homeowners. The Villas at Benchrock is just north of Huber Heights in Tipp City, Ohio. Residents have easy access to dining and shopping like Gander Mountain, Meijer, Kroger, and Target as well as attractions such as Wright Patterson Air Force Base and Danbarry Cinemas. Homeowners are also near plenty of healthcare facilities. Residents looking for big city fun can head to Cincinnati that s an hour south or to Columbus, which is a little over an hour to the east. For farther travel, Dayton International Airport is only 20 minutes away. The Villas at Benchrock offers homeowners attractive amenities, elegant homes, and a quiet community to call home in Tipp City, Ohio. There are plenty of activities available in The Villas at Benchrock. Here is a sample of some of the clubs, activities and classes offered here. These elegant attached homes offer 1,137 to 1,861 square feet of living space. They have two bedrooms, two bathrooms, and an attached two or two-and-a-half-car garage. Homeowners can entertain guests with open floor plans and flexible living spaces. They can also enjoy spacious master suites, gourmet kitchens, and large walk-in closets. Moving to The Villas at Benchrock has been such an amazing experience. The neighbors are so warm, friendly and caring. Everyone looks out for each other which is really important for me since I live alone. The clubhouse is great and it is easy to meet people. I purchased the Colonnade model this past spring and am very pleased with it. I use the extra bedroom for when my grandkids come visit and I use the den for a craft room. The outdoor courtyard is so nice! I even bought an outdoor table-top heater so I can enjoy spending some time out there in the colder months. I'm slowly getting in the swing of things, using the clubhouse and getting to know people. So far so good! 55places.com is not affiliated with the developer(s) or homeowners association of The Villas at Benchrock. The information you submit is distributed to a 55places.com Partner Agent, who is a licensed real estate agent. The information regarding The Villas at Benchrock has not been verified or approved by the developer or homeowners association. Please verify all information prior to purchasing. 55places.com is not responsible for any errors regarding the information displayed on this website.